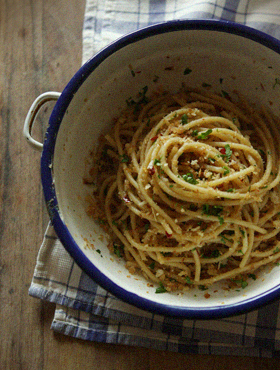 I love this Sicilian style spaghetti. It’s quite unusual that sprinkle breadcrumbs over pasta. But the crispy toasted breadcrumbs add a nice crunchy texture and a nice flavour contrast to the anchovy sauce. 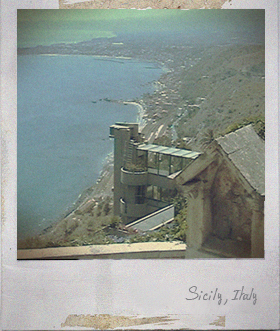 I wish I was at the beach right now, somewhere like Sicily, even though I swim like a rock. To make breadcrumbs: peel and lightly crush the garlic cloves, place into a frying-pan with 2 tablespoons of olive oil over medium heat. Fry the garlic until golden, then remove and discard. Add the breadcrumbs in the frying-pan and stir-fry over medium heat until crisp and golden. Set aside. Transfer the breadcrumbs to a plate, leave to cool. Add the parmesan cheese and chopped parsley, mix everything well. Set aside. To make anchovy sauce: Heat the 3 tablespoons of olive oil in a large frying-pan over low heat, add the chopped anchovies, breaking them up a wooden spoon until they dissolve into the oil. Add the chopped garlic and chilli flakes, stir-fry everything until the garlic became golden. Set aside. Add the spaghetti to lightly salted boiling water, cook until al dente (follow the package directions). Drain and return to the pan (keep 2 tablespoons of pasta water). Add the anchovy sauce and 2 tablespoons of pasta water in the pan, toss well. 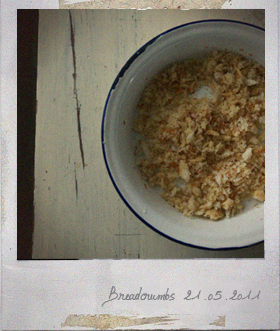 Add half amount of the breadcrumbs and mix. Transfer to serving plates, sprinkle with the remaining breadcrumbs. 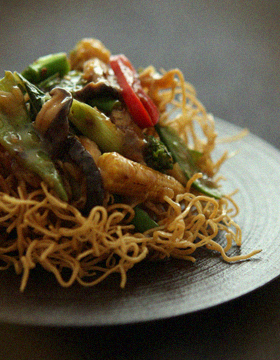 Thick black bean sauce goes perfectly well with crispy noodles. My body is happy with a lot of green vegetables today. 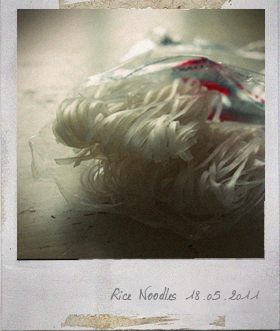 Cook the rice noodles (follow the package directions), drain and rinse under cold water, and drain well again. Set aside. Heat the deep-frying oil to 360F. Devide the noodles into 2 portion and deep-fry a portion at a time until they became crispy. Place them on kichen paper to remove excess oil. Cut the vegetables into bite-size pieces. Heat the vegetable oil in a frying-pan over medium heat, add the vegetables, ginger and garlic, stir-fry about for 3 minutes. Add the black bean sauce and in the frying-pan and stir-fry for 1 minute. Pour over the vegetable stock soup and bling to boil. Add the corn flour (mixed with water) to thicken, then add the sesame oil. Serve fried noodles on plates and pour the sauce over. 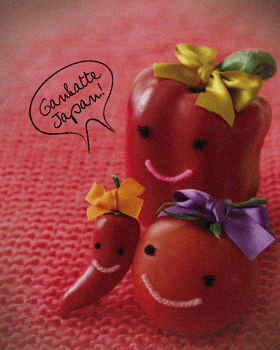 This is also a very traditional Japanese dish and it’s suitable for vegans. You can make dashi stock from dried shiitake mushrooms too. It’s very easy to make; just soak them in lukewarm water for an hour, and then, here is the umami-rich dashi stock. Shiitake soup stock: Place the dried shiitake mushrooms in the lukewarm water, leave for 1 hour at least, strain with a fine meshed sieve (if you don’t have a time, boil the dried shiitake mushrooms once and leave for 10 minutes). Place the shiitake soup stock, soya sauce and mirin in a pan and bring to the boil, turn down the heat to low and simmer the noodle soup about 2 minutes. Heat the oil in a deep pan to 340F. Cut the red pepper and butter nut squash into bite-sized slices. Place 150ml water and 2 ice cubes in another bowl, add the flour mixture, mix together very lightly with chopsticks. Lightly dip ingredients in the butter and immediately deep-fry them until crisp. Drain excess oil on kitchen papers. Place the cooked soba noodles in a deep bowl, sprinkle chopped spring onion, pour in the hot noodle soup, arrange the vegetable tempra on top. I decided to make this menu when I was thinking how to use a slightly stale yesterday’s baguette. Fresh breadcrumbs are really easy to make. Put the bread in a food processor or cut the bread finely with a bread knife. 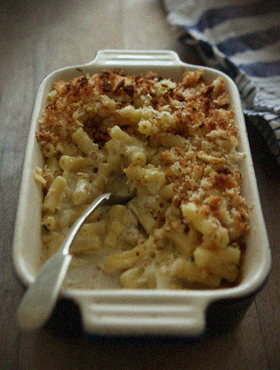 This seasoned breadcrumbs taste like garlic bread, it goes well with the macaroni cheese. Cook the macaroni pasta in a large pan of salted boiling water until al dente (follow the package directions). Drain and return to the pan. Add the single cream, milk, grated cheddar cheese and grated parmesan in the pan, cook and stirring over low heat for 3 minutes. Add the chopped thyme, season with a pinch of salt and pepper and transfer into a baking dish. Place the fresh breadcrumbs, minced garlic and melted butter in a bowl, toss until well combined. Sprinkle the breadcrumbs onto the macaroni mixture and bake in a preheated 200C/400F oven for about 7 minutes until golden and crispy. This is very simple but flavoursome soup noodle recipe. 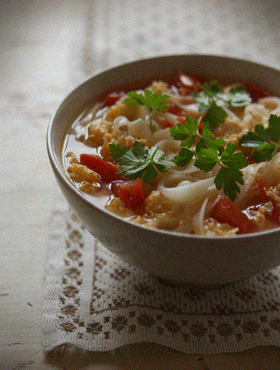 Tomatoes and crab meat provide natural umami flavour into the soup. Quick and easy to make, healthy and filling. It’s a great light supper dish. Cook the rice noodles (follow the package directions), drain and set aside. Heat some oil in a flying-pan, fry the drained canned crab meat for 1 minutes, transfer to a bowl and allow to cool. Add the egg and beat together. Cut the tomatoes into small cubes. Heat some oil in a medium sauce pan, fry the tomatoes few minutes and add 600ml water, bring to the boil. Add the fish sauce and season with the black pepper. Pour the egg mixture into the boiling broth, stirring slowly. Place the cooked rice noodles in a bowl and pour over the broth. Garnish with some coriander. 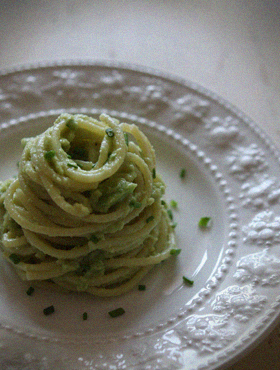 This is a chilled pasta with very rich and creamy wasabi-hinted avocado sauce. If you enjoy a little kick of wasabi, then this appetizer is for you. I love the unique flavor and hotness of Wasabi. 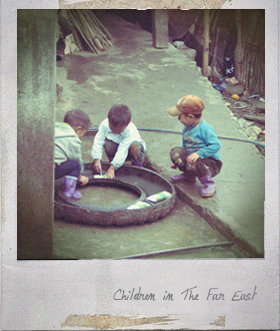 But I hated it when I was a child. I don’t remember how and when I started liking it. The same thing happened to black coffee, beer and Marmite. I want to know where is the ‘hate’ to ‘love’ switch and how to operate it. Cook the pasta in a large pan of salted boiling water until cooked (follow the package directions). Drain and rinse well under cold water. 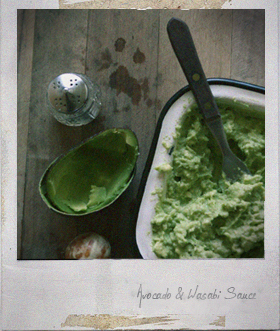 Peel the avocados, remove the stones and mash with a fork fairly smooth in a bowl. Add the wasabi, minced garlic, lemon juice, mayonnaise, walnut oil, salt and pepper, mix together well. Drain the cold pasta, toss with the avocado sauce. Sprinkle with the chopped chives. You know, red coloured foods make you feel lively. 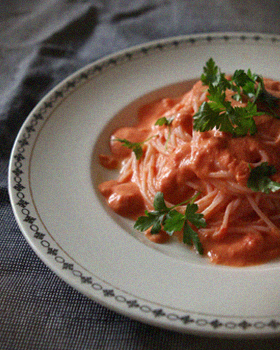 This red sauce is made with full of red coloured ingredients, tahini and lemon juice. It has a refreshing taste, also the tahini brings nutty and rich flavour. Rice vermicelli noodles takes only few minutes to soak in a hot water to cook, it’s a great energy-saving ingredient. Full of red foods and full of pep. Soak the rice vermicelli noodles in hot water (follow the package directions). Rice well under cold water and drain well. Place all the Red sauce ingredients into a blender and blend until smooth. Mix the noodles and the red sauce in a bowl. 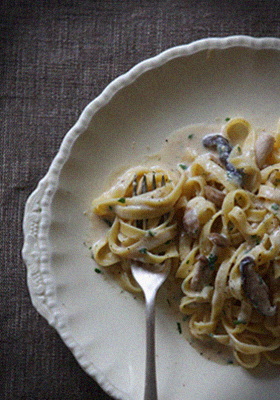 This is a unique, creamy low-fat pasta dish and it’s suitable for vegans. Soya milk and miso (fermented soya bean paste) go well together, because they are made from same ingredient. And a spoon of miso paste brings a great savory and richness to the sauce. Cook the tagliatelle as directed on the package. Drain and set aside. Heat the olive oil in a flying-pan over medium heat, add the garlic and mushrooms and fry for 3-4 minutes. Add the white wine into the flying-pan, bring to a boil over high heat. Turn the heat to low, pour in the soya milk and heat until piping hot. Add the miso paste and stir until the miso is melted. Add the cooked tagliatelle and chopped parsley into the flying-pan, tossing everything together. 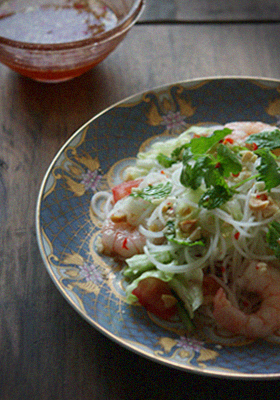 I love this Vietnamese style fresh noodle salad. This is like a delicious medicine. I’ll never get board of this fresh, zesty taste, and it’s very healthy with a lot of herbs and vegetables. I can physically feel that my body is delighted when I’m eating it. The main ingredients of this dressing is Vietnamese fish sauce called nuoc mam. Nouc mam is a fermented fish sauce and it has a pungent smell itself… But when you use nuoc mam for a cooking, it does really enhance flavour of the dish, lifting the taste of other ingredients. All the ingredients are helping each other to be delicious on a plate. To prepare the noodle dressing, mix all ingredients of the dressing in a small bowl. Set aside. Tear the iceberg lettuce into pieces, chop the cucumber and tomato into cubes, and set aside. Cooke the thin rice noodles in a large pot of boiling water until cooked (follow the package directions). Drain and rinse well under cold water, and drain well again. Transfer the cooked thin rice noodles into a large bowl. Add the boiled prawns, iceberg lettuce, cucumber, tomato, coriander leaves and mint leaves. Pour over the dressing, toss everything together in a bowl. Dish up the noodle salad and sprinkle on the crushed peanuts. 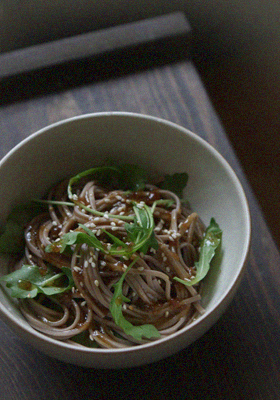 It’s a Japanese tradition to eat soba noodles on New Year’s Eve. 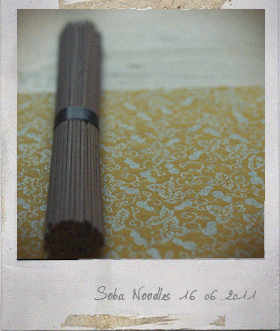 Soba noodles symbolize longevity because it’s physically long. And, Soba noodles are easy to bite and cut off, so it’s considered to sever any hardship that have happened during the year. I was thinking it’s a strange custom. But when I looked up the nutrition of buckwheat (the ingredients of soba noodles), I started to think that the custom might make sense. Buckwheat is very high in rutin, an essential nutrient that is not found in other grains. Rutin is powerful antioxidants that fight free radicals which are responsible of some of the major health problems such as cancer, arteriosclerosis, strokes, and age-related senility. Also, buckwheat is rich in vitamin B1 making them a good option got those recovering from stress and wanting to regain a decent energy level. Good. 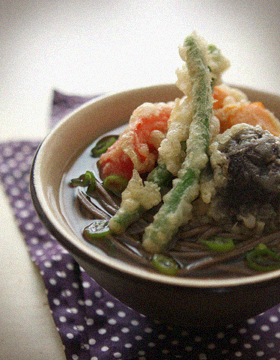 I eat soba noodles today, wishing good health and not to carryover any bad things to 2011. To prepare the dressing, peel and grate the onion, place the grated onion, balsamic vinegar, olive oil, soya sauce and lemon juice in a bowl and mix well. Season to taste with a pinch of salt. Transfer the soba noodles to large bowl. Add the dressing and toss to coat. Add the rocket and toss gently.